Dr Williams’ Pentecost letter entitled “Renewal in the Spirit” represents a shift in the Archbishop’s agenda, as it calls for a return of a regime of substantive meetings to address the issues dividing the Church. And in light of criticisms made by the Global South primates and leaders of the Episcopal Church that he has arrogated to himself powers he does not rightfully possess, the Archbishop also appears to have backtracked and conceded that authority also resides with the Primates and the individual Provinces. The Archbishop’s Pentecost letter is the public half of a campaign to rein in the Episcopal Church, The Church of England Newspaper has learned, and follows a private letter delivered to Presiding Bishop Katharine Jefferts Schori asking her to consider withdrawing from active participation on the Standing Committee of the Anglican Communion. A letter from the Archbishop is believed to have been given to Bishop Jefferts Schori at the April 17 consecration of the Bishop of Connecticut, Dr Ian Douglas. Neva Rae Fox, a spokesman for the Presiding Bishop said she could not comment as she was not present at the Connecticut consecration. Dr Williams’ office would neither confirm nor deny the story, citing its policy of not commenting on the Archbishop’s private correspondence. Mark Harris posted this last Friday, BB, since when nothing has surfaced, either side of the Atlantic, to suggest that it is true. Yesterday a commenter at that site said "Wait, wait, wait! Since when has George Conger been a 'reliable reporter'?" A fair question. Wow, good news one week, bad news the next, then the next week.... Assuming this does indicate the start of some movement--the jury is still out--the question becomes whether the Starship Schori will continue employing its canonical tractor beam to drag unwilling U.S. dioceses and parishes along with it as it drifts further out of the Anglican orbit. "The Church of England Newspaper has learned, and follows a private letter delivered to Presiding Bishop Katharine Jefferts Schori asking her to consider withdrawing from active participation on the Standing Committee of the Anglican Communion." Only one little problem, I'll bet KJS hears that as an American verse the subtleties of polite British society. Agreed, Anon. Why be so devoted to a *brand name* that does not really describe her theology? Unitarian is definitely closer to her theology than Authentic Anglican Christianity. When I first saw this last week, passed along in an AAC newsletter (without some of the details on Conger's article) I was led to wonder if it might not have been a letter asking for Douglas' (rather than KJS) resignation from the standing committee. Upon his elevation to bishop, he no longer qualified at TEC's clergy rep on the ACC, and therefore also lost his place on the standing committee under ACC bylaws. (ACI and others have laid this out in detail) The timing, on his consecration, makes sense that way. However, I believe the Standing Committee meets next month. And I suppose we will then discover who is, and who is not, a member in good standing. It would seem that the ABC has finally run out of what seemed to be inexhaustable patience. Now that +++Rowan has apparently laid this at ++KJS's feet; it'll be interesting to see now how the next act unfolds. A side bet? Look for a confederation of TEC and the Canadian church to form before Labor Day. I'll take George Conger's word any day of the week. He's a man of honor. This seems to be an peculiarly elusive story and I'm not certain it's accurate. It has been knocking around for several days and no one can pin it down. I must say, however, that I would consider the Archbishop of Canterbury well within his prerogatives to have "invited" our Presiding Bishop to withdraw from participation on the Standing Committee, given the stick-in-your-eye approach of TEC to the Glasspool matter. An event like this behind the scenes might also explain the PB's recent rhetoric concerning centralized authority, although the more obvious explanation is that she is reacting to the Secretary General' s actions re TEC Bishops' participation in ecumenical bodies. The Presiding Bishop cannot be surprised if this is true. This is exactly the kind of consequence that Bishop Johnston alluded to in his statement concerning his vote against Glasspool. Unlike Lakeland Two, I don't have great faith in the accuracy of Conger's reporting. However, if the request was made, it must be seen as a request. Bishop Katharine was elected to the Standing Committee and I think that Dr. Williams does not have the authority to remove her. George+ is an honorable man, and I have the faith that his reporting follows the lines of his character. Have you met him, Fr. Weir? I base my comments on having met him and seen him in action several times. But as usual, if one doesn't like the news, slam the reporter. Kevin Kallsen with Anglican TV has been banned just because his camera has been showing what's going on in the Communion. How can openness be detested? Because it does shine light into darkness. Any request or demand (which is so un-British) could be rejected. Will the Standing Committee vote to exclude? Especially since it's pretty stacked with TEC-friendly members? Ought to be interesting, but in the end, if KJS is not out of the Standing Committee, the rest of the Communion will see it as another failure of leadership. While TEC and its friends may not understand the long-term impact, if KJS does not stand aside, her remaining on the SC will erode remaining ambivalance within the moderates further. If KJS and TEC truly believe in their trajectory, time to stand up and take the hits. Either it is blessed or it isn't. Time to tell. Daniel Weir- there are clearly several ways in which KJS could be removed from the standing committee, although only two involve solely the authority of the ABoC. And the timeframe in which some would take effect would not occur until after the next SC meeting. 1) The standing committee itself could remove her. Clearly, if the Standing Committee, on its own authority, could bar a Ugandan delegate from taking his seat at ACC in Jamaica because he was involved in a "border-crossing" in the US, the SC can deny a seat to the consecrator of Glasspool- who openly, intentionally, and personally broke the first of the 3 moratoria. KJS established the precedent herself when she challenged the Ugandan delegate on the basis of a moratorium violation. In truth, under the circumstance, given the precedent, the honorable thing for KJS to do would be to resign- she cannot deny the violation of now all 3 moratoria (as bishop of Nevada she authorized SSBs, she is the consecrator of Glasspool, in addition to consenting to VGR, and she is currently in communion with, and many believe financially supporting, a rogue deposed bishop and his breakaway church in Uganda- that makes it 3 for 3). 2) The Archbishop of Canterbury could break communion with KJS personally, or with TEC corporately. If you are not in communion with the Archbishop of Canterbury, you cannot claim to be a primate of the Communion, by definition. 3) The ABoC could decline to invite her to the Primates meeting, in which case someone else would be elected to the seat. 4) The Primates could rearrange the current "continental" representation. This needs to be done anyway, since one Primate represents 50% of the Communion that lives in Central and Southern Africa, and the other 4 Primates on the SC represent the other 50%. TEC would then not dominate the voting in their region, since it would be much larger. 5) The ACC could take legislative action to restrict TEC's ability to sit on any committee, including the standing committee. And those are just the ways that occur to me off the top of my head. If the ABC really wants to do WHAT is within his power he can go ahead and make a statement against all of those absolute liars like Jon Bruno, Chane, and others who said that they agreed with Windsor moratoriums only to get to Lambeth '08. Now is the time to announce that their presence is not recognized for the future. In a brief search of the internet for more on the allegation concerning the "banning" of Kevin Kallsen, I can only find the statement above and an April 21st Stand Firm post, also from the Lakeland Two. Off topic, I know, but a little background on this? Does anyone have an understanding on whether the law suits would be affected if TEC formed its own communion? Also would ACNA then become the Anglican Franchise in the USA? Hmmm..I will only believe this report when I see something official from Lambeth Palace. Looks like the existence of the letter is confirmed and that Schori apparently has been asked to absent herself from the next Primates' Meeting as well as to depart the Standing Committee. Ka-boom. Lapinbizzare- I am asking for permission to quote my source on ATV. When the Archbishop of Canterbury, Dr. Rowan Williams was invited to St Vladimir’s Seminary in New York to deliver a lecture and receive an honorary degree in January, Canon Kenneth Kearon----the General Secretary of the Anglican Consultative Council---telephoned the schools’ dean and made two requests. He asked that Presiding Bishop Katharine Jefferts Schori be invited to the ceremony, and ask that Anglican.TV not be permitted to film the proceedings. Thanks, Lakeland Two. Just curious. No agenda. So it was Kearon & maybe the ABC who wanted this? And now, it seems, K has moved from annoying just the one wing of the communion, to annoying both. Mark Harris, who is on the Executive Committee, has just posted the first of what will apparently be at least two pieces on Kearon's meeting(s?) with the Committee. Roger/Lapin - I think all of these meetings and events should be available for all to hear and see. Let us all judge for ourselves. It's said in Scripture multiple times that things hidden will be brought out into the light - and that applies to both sides. I give the Ex. Council credit for not closing the meeting, though a gig to Kearon for asking for it. But I am embarrassed as a member of TEC that they cut him off - especially after asking him to come on his vacation. It proves yet again that the "conversation" is one way, dissent is not considered part of the conversation. There is no room for dissent in this Church. You either buy into the Great Lie or you are slowly melted into second class membership. Remember all the promises made throughout this Church about W.O. when it was adopted? How it was voluntary? How there was "room" for dissent. No one would be forced into anything. The tent was big? Fast forward to now and you have your answer: none of that was true. This Church is run by heretics who can't stop themselves in their own lies and so there is no recourse but to keep telling them. Now, time has come to answer up and there is no recourse but to...you guessed it...keep on lying to themselves and the rest of us. I know that dissent is not allowed in this Church through the actions of Bishop Neff Powell of Southwestern Virginia. At one time he had a blog in his diocese. It was a free-flowing forum where real voices of concern and dissent were found. Sometimes a bit wild, but isn't that part of the "conversation" that revisionists promised? When things got too hot for him in the blog he shut it down. I wouldn't take the discontinuation of a blog as a sign to squelch dissent. Maintaining a blog is time-consuming. Good ones are hard to find. I never have encountered or observed any problems in the Diocese of Virginia with people not being able to express views on the issues of the day. In fact, it always struck me as odd that many people would leave rather than stay to express their views. Well, All I know is that when the heat turned up, the blog turned off. Like so many other facets of information control in that diocese, one can see that things are carefully portrayed with very little acknowledgement that there is any rift, complaint, or split in this Church. I don't buy that things were too time consuming. The blog didn't speak the line so it was canned. BTW: When people (those that left)keep casting their pearls before the swinish, divisive, and heretical behavior of radical revisionists they usually don't hang around to keep up the entertainment value of portraying a conversation that isn't happening. To tickle the fancy and delusions of revisionists isn't our duty. Perhaps not, if that's how you choose to frame it. However, some would say that there is a duty to promote Christian unity and to witness for correct doctrine. My unscientific guess is that the rank and file membership of the Episcopal Church is less "revisionist" than are the rather narrow group that purports to leave the church. I suspect that may also be true of the clergy. I think that in manufacturing the case for leaving, the size and proportion of the revisionist elements have been magnified beyond what reality would indicate. But these things are impossible to measure accurately. in last comment, "leave the church" should read "lead the church". Sorry about that. It really changes the meaning. You wrote, "There is no room for dissent in this Church." For a moment I though that you were criticizing traditionalists for demanding that there be no dissent from their position on same-sexuality. Foolish of me. I think the actions taken in recent years about the ordination of women do not amount to a stifling of dissent. Bishops are still free to refuse to ordain women and parishes are still free to have only male priests. What has changed - I hope - is that Bishops are no longer free to impose their convictions on parishes who disagree with them. Why should a Bishop be allowed to deny a parish the right to call a women to serve as rector or assistant? Is there to be no room for dissent in dioceses where the Bishop's convictions are such that he cannot in conscience ordain a women? "What has changed - I hope - is that Bishops are no longer free to impose their convictions on parishes who disagree with them." Isn't TEC requiring a Bishop who does not believe in WO to go against his own convictions by requiring him to allow a female priest in his diocese? I think you are right, but the question remains as to whether the Bishop's convictions should trump those of others in the diocese. I recognize that an argument can be made that they should, but I don't agree. Having been a candidate for a parish that had been denied the option of considering women priests, and having seen the effect the Bishop's denial had, I think Bishops should be willing to license priests who are women and to confirm their election as rectors. I'm just at a loss. So the bishop's authority in his diocese is cut when the parish wants something different when it's a female priest? Yet it isn't when the shoe is on the other foot - say, a conservative parish doesn't want something else the bishop wants (insert any liberal item)? Is that not chaos? It goes back to what I have asked over and over again and never have gotten a workable answer (and only got one answer at that): Where do you draw the line at what is acceptable and what isn't. For the last 2,000 years the line has been what Jesus taught, and now that's picked and choosed through while disregarding even the "Red Letter" parts of the Bible. We are reaping the sad results of the abandoning of listening to God. Without workable rules, much less than obeying God, we are failing in our church and we should be the example for our society, not just another example of it. If we all are doing our own thing under the guise of "diversity" what are we really saying to the rest of the world? Do your own thing as long as it's your way? That isn't what God has taught us from the beginning and if you (in the plural sense - not just Fr. Weir) aren't willing to submit yourself to God and His rules you have no business being a priest or a bishop or a presiding bishop. "the question remains as to whether the Bishop's convictions should trump those of others in the diocese." Isn't that the way TEC polity has worked until now? The only way you can justify this statement is if TEC polity is hierarchical. The problem with this approach is that it is hierarchical when useful for the PB and DBB and it is not when it is more convenient to refer to TEC as democratic and bottom up. This parsing of polity results from inconvenient inconsistencies. Having raised a very small point about the conflict between Bishops and lay people over the ordination of women, I will resist the temptation to get drawn into the issues that Lakeland Two raise. I have insufficient time to address them and I am sure that whatever I might write has bee written before on this and other blogs. I am not insane and thus will not repeat ad nauseum the arguments that have been unconvincing in the past hoping that there will be a different outcome this time. I'm not trying to sandbag you. This is a very real question on issues that matter to conservatives. But the conversation ends when we bring up things that are non-negotiables for us. Until you or your mates can reasonably discuss that, we are at an impasse. Diminishing a question/person by labeling it "a very small point" is reflective of the mentality that has placed our church in the position it is in. What's important to "you" trumps what is important to the other "you". Pure chaos. That is not of God. The question of what is the deciding factor for the future is an important question. I think Dale Matson perfected the thought in his last post. That the question is avoided is not surprising because it would require accountablity. Having no absolutes is far more convenient. One last thought before I take my better half out to the dentist. Scout is the only one who had the guts to respond to "Where is the line? What will you do when TEC goes too far for even you?" His response, if I remember, was that he would leave without thought of taking the property with him - my words not his. My problem with that is the problems never get solved, just magnified. The question of who left, who's Anglican, just keeps reminding me of Solomon and the women fighting over the baby. God blesses that which pleases Him. BB's previous post - If a house is divided against itself, that house cannot stand. TEC's not growing. These swapping agruments aren't solving anything because we are of two different mindsets. Present some solutions that honor God. In absence of that, the conversation is over. Which is why many have left. My opinion is that even here in Diocese of Central Florida the Episcopal church will not be recognizable in 20 years. I will retract my "very small point" label because I actually think that it is a large point, i.e., the freedom of parishes to call priests. What I should have written was that I was unwilling to get drawn an extended discussion of the larger issues. I believe that arguments can be made on both sides of the issue of a Bishop's authority to refuse to approve the calling or a licensing of a woman priest. I think my position is right, but I see the point that the other side is making, i.e., even being required to recognize the ordination of a woman as valid can be seen as a violation of conscience. 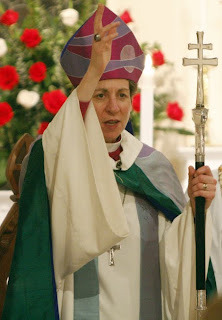 What that position logically leads to is the conscientious refusal of such a Bishop to recognize any the validity of the ordination of the PB or any other woman ordained to the episcopate, and, perhaps of the validity of any action by the General Convention where women are seated as clerical deputies. If a Bishop's conscience leads him to that conclusion, I wonder why he would want to remain in the Episcopal Church. On the larger point that Lakeland Two raises, there are many of us in the revisionist camp who take serously the authority of Scripture and who are somewhat offended when traditionalists insist that we don't, simply because we have different interpretations of Scripture on certain points. I don't expect people to agree with me, but I would rather not be dismissed as not holding that Scripture is authoritative. Try reading the Gospels and the Epistles with an eye to the diversity of understandings of Jesus, e.g., that are there. No matter what Canon Kearon says, I don't see theological diversity in the Communion as a problem. Fr. Weir, I want to respond to your comment, but have been serving my spouse as caregiver the last few days. I wanted you to know we were not ignoring you. Fr. Weir, First, thanks for retracting your "very small point" label and understanding the complexity of the bishop's authority and the parish not following it depending on the issue. It is troubling because I have no problem with a bishop who lines up with God's word. But I have a problem with those who don't and are out rewriting what Jesus said and meant. You make a point that a lot of us agree with. Why would a bishop or priest be in a church where they don't agree with the position of the church? Yet, Pike, Spong, Righter, etc., did and things were changed - from what they were. Why could they have not left? Why couldn't the Susan Russells and Gene Robinsons, etc. gone and started their own church? Why was it promised when women's ordination was crammed down our throats that there would always be room for the diversity of those objecting? Now there isn't - even by your own words. Now it will be gay ordinations/consecrations. What's next? And then I get back to the same old question: What happens when it's too far for even you? Why would anyone stay? Because of the vows they took: to defend the church from error. Why should we have to leave because people like you want to change it? Why don't YOU leave? Not so easy, is it? I understand you don't like to be challenged as to your interpretations of Scripture. Who does? But here's the thing. Where's the line? At what point does your "interpretation" intersect with mine? Or worse, with Jesus'? You see, I have a very real problem with divorce. Jesus says God hates it. That matters so much to me I waited until I was 31 to get married. While there are times I'd like to FedEx my spouse Next Minute back to Mom, I know we have to work it out. But if I were in the position of a divorce, I know remarriage is out. Because Jesus said so. I struggle in other areas where Jesus said not to do things. But I do struggle to comply. Does He forgive? Yes. Are there situations where divorce is necessary? Yes. But a bishop in the church to be twice-divorced and three times married is a disgrace. When you pick and choose or "interpret", it is those interpretations that tell the rest of us how close you are to believing in the "authority" of Scripture. God gives discernment. Perhaps, instead of being offended, be challenged to question yourself in prayer with God if He's happy with your interpretations. Do your interpetations line up with God's character or man's desires? That's a question that only you can answer for yourself...well, only God and you. All the rest of us do is line what you say up against God's word. For me, if it doesn't line up, I question it - no matter who it is. We are supposed to hold everything up - and it doesn't matter how "good" someone may seem. They can make mistakes - they're and we are all human. I'm kindly asking for your approval of this comment as a link to my blogspot blog, no spam intended.